Go beyond weight loss and learn how one man used VR to get back in shape and get back his life! You’ve seen the story and heard all about how ‘regular guy’ Job Stauffer lost 50 pounds using VR, specifically Sound Boxing. While the headline grabbed a lot of attention, and we’re thrilled he found this path to fitness, we’re even more happy that he cheated death and reclaimed his health. We had a chance to sit down with Job and get his full story on using VR for fitness and wellness, what made him start and what the future hold for his fitness and life, both virtual and real. VRFI: Take us through what made you get to the point that you decided you had to make a change in your life to get fit and healthy. What was your fitness level before you started using VR to get in shape? JS: When you have a gut, you think to yourself that if you go to the doctor, he’s going to tell you that you’re overweight. So you let that slide until the next time you go to the doctor, and he says you’re actually obese. It’s scary, but maybe you don’t really get too worried. You say to yourself: “No Big deal, I’ll start working out and in a couple weeks or months I’ll be back to being just a little overweight.” In my case, it had slipped so much through stress and over-eating and not taking care of myself that the next time I was at the doctor I slid on that scale and he told me I was morbidly obese. Those are hard words to hear. Then it hit me again because my doctor said: “You have to get in shape or you’re going to die.” Those were harder words to hear. So, I guess you could say that’s where my fitness level was before I tried using VR to workout. VRFI: Why VR? What else have you tried and how were your results? JS: When you’re overweight, people will just say things like ‘get on the exercise bike.’ Frankly, I love cycling, and I’ve done a lot in the past, but the sad reality is that if you’re over 300 pounds, you’re probably actually too heavy for that exercise bike. It’s among the saddest ironies in the world. Fitness equipment that you’re too heavy to use. When you get to the point where you’re too heavy for fitness options you’re passionate about, and also too heavy to even sit on an ergonomic chair meant to help alleviate problems likely caused by being overweight – you’re basically at odds with life. The anxiety that induces is crippling. I needed something else. Something fun that didn’t feel like working out. Something that actually gave me the results I needed, and something that helped me forget about the state of my body while I was using it. I needed something that I could find promising by own determination, and not by a TV salesperson promising me everything for just $29.95 plus shipping and handling. I never quite found results with anything that promised me results, so I turned to VR to pave my own way and make my own promises. No one told me it was going to work besides myself, and I wanted to make it happen. VRFI: What made you think that VR would be any different? JS: I felt VR would work because I wasn’t in a gym and no one was looking at me. It’s easy to get self-conscious at the gym when you’re not exactly in the same shape as everyone else at the gym. That may not sound very body-positive, and that’s because it isn’t. It’s tough to fight that self-consciousness. It may be one of the biggest hurdles people in these situations really have to face. For me, I found that when I was using VR, even if there were people looking at me, physically, VR just put me into an entirely different place, mentally. It helped to disassociate all the negative thoughts I had about my own body. There were no mirrors. No peering eyes. And more importantly, I couldn’t see myself, and I wouldn’t let my own negative image of myself overcome my willingness to try. When you’re on the treadmill, and you’re trying your best and at the same time you look down you can still see your gut and feel bad about yourself, it can be hard. VRFI: Often people come to a significant crossroads in their health and you had a run in with a doctor who told you that your life was on the line. How did you end up getting to that point? What made you visit the doctor and why was now the time? JS: I was on vacation with my wife when I started getting these terrible piercing headaches. I didn’t know what was happening and I almost wanted to stab a knife into my skull to stop the pain. I was genuinely worried. My wife was worried. I thought my brain was going to explode. That had me visit the doctor, and finally and he told me everything. I also was worried because I had a trip coming up to Europe for my day job and I was so stressed out about flying that and I had to get an MRI to check out my brain to make sure I wouldn’t have some sort of aneurism crossing the Atlantic. VRFI: Did you end up going on that trip? Were your health issues a problem? JS: Luckily, my brain was okay, and I was cleared to go on a plane, which was nice. They did say it was a combination of stress and lack of physical fitness. They recommended a bit of a reset, and definitely more time off to recharge and re-assess my fitness level. So after finishing up some work, I took a week off to check out Switzerland and Amsterdam and tried to re-center myself and figure out my life. See if I could find a way out of this mess and maybe ultimately – you know – not die? VRFI: What ended up coming out of that? JS: It’s funny. In Europe, just watching how people behaved and how there seemed to be less people struggling with obesity, I had a hunch there was just something different in the way that people viewed their heath. I remember visiting a health club, and I remember seeing two very different sides of the facility. One side was overstocked with typical gym equipment we see all over the states, helping people focus on their fitness. The other side was a blend of Olympic Pool-sized Jacuzzis, aroma-therapy chambers, reading and relaxation rooms – all more centered around focusing on wellness. Just the general idea of feeling calm and at peace with yourself. A health club like this really helped me understand that when it comes to your ‘health’ – your fitness and your wellness are two sides of the same coin. You’re not going to get fit if you’re not well. And you’re not going to be well if you’re not fit. When I thought my brain was going to explode and doctors told me it was a combination of stress and fitness – then realizing both needed to be addressed at the same time as cultures overseas seem to understand – it was a wakeup call. VRFI: Do you remember your first actual workouts in VR? What were they like? VRFI: Clearly you did keep at it and saw a lot of results! Did you make any other changes? JS: So I started drinking lots of water and being more conscientious of everything I was eating and trying to be under 2000 calories a day, primarily lower carb, which I had done for years but without a proper exercise routine and it really wasn’t working. VRFI: Walk us through the role Sound Boxing played in your weight loss. JS: Oh wow! The start of a love affair, this one! So, sometime after summer ended, not long after that trip to Europe, I found some access to Sound Boxing – this unsuspecting little project on Steam being sold for $7.99? It looked simple enough, and on the surface, looked like a variation on AudioShield, another early example of good VR workout material. I loaded it up, and the next thing you know I am absolutely fascinated and I could not believe that something so simple was really getting me moving so much and getting me sweating so much. I was blown away. I started using it every day. Initially, it was small periods of time. Sometimes 20 to 25 or 30 minutes. Then I moved to 45 minutes to an hour. Sometimes I did an hour and a half. Every day or every other day that I’m home, it’s been my primary fitness routine. VRFI: Some people are assuming that VR fitness could just be a fad or something a few people will use for fun weight loss, but that it won’t actually become anyone’s long term fitness routine. How are you approaching VR fitness? JS: I am approaching this as a fitness routine. Out of everything I’ve tried over the course of my entire life, THIS is the fitness routine that is the most fun. It’s combining my love of video games with the thrill of literally feeling as if I’m inside of these video games – and I’m forgetting that it’s an incredible workout in the process. VR in general has given me a fitness routines that keeps me engaged and makes me want to work out and really make look forward to the time I get to do it. It helps take the ‘work’ out of ‘workout’ and combines it seamlessly with the very little time I have to play video games these days. For Soundboxing, I had added weighted gloves early on, just one pound extra per hand, and it’s helped me tremendously. Recently, I’ve also picked up a 40lbs adjustable weighted vest. Overall, no matter what content you’re using, you’re going to get out of it what you’re putting into it. I decided to put a lot of time into Soundboxing, and I still do. It completely captivated my body and my enthusiasm to work out every morning. I just rock out and move my body to music. VR is something that has genuinely save my life. It’s helping me get on a very healthy track. This is something I’m going to keep doing and I hope that continuing to talk about it can inspire others to seriously consider virtual reality as a tool to find a fitness and wellness routine that will help improve your health and your life. That’s the other thing, too, the wellness aspect. The sheer joy of being inside of a video game and having fun playing it all the time – that’s been a huge boost to the wellness aspect, and it’s tackling the fitness aspect at the same time. It’s truly been wonderful! VRFI: What other experiences are you most impressed with lately? JS: Besides Soundboxing and my recent addition of John Wick VR, I recently tried Gorn (Free Lives / Devolver), Sprint Vector (Survios), Sparc (CCP) and Robo Recall (Epic) – they’re all great workouts. Overall I’m just impressed with how many games on the horizon seem to finally be taking advantage of the fitness aspects of VR, without really being positioned as fitness products. My hope is that maybe some of them will continue to fly in this direction, and hopefully it won’t deter anyone who ‘isn’t looking for a fitness game’ – but end up surprising players by how much they enjoy the exercise aspect of the fun they’re having. VRFI: How’s your progress and weight loss now? Are you still losing weight? JS: I’m 60 pounds down now and I almost feel bad for the story hitting the circuit as ‘man loses so many pounds in five months.’ Realistically, my goal is that I’d love to do an update in a couple months where I’ve lost 100 pounds. VRFI: This isn’t just about losing weight for you though, is it? You seem much more passionate about this than just hitting a number on the scale. JS: Aiming for 100 pounds? Definitely irrelevant. Maybe I’ll hit that number, maybe I won’t. Maybe I’ll get close and I’ll do more toning and want to bulk back up with more muscle. Who knows?! What I do know is that it’s working, I love it, and I have no plans of stopping anytime soon. At the end of the day it’s not about that number. And I’m not obsessed with that number. While it’s significant and it’s a good milestone, it’s not about the weight. It should be about getting healthy and feeling better. Just the other day, I actually felt good enough to go shirtless at a pool – I haven’t done that in 25 years! It feels good. I feel better. This is what’s important. VRFI: What advice would you give to anyone wanting to try VR for their own fitness or weight loss goals? JS: If you’re about to start doing something like this, don’t make it over-complicated. Treat it just like you’re spending time having fun and playing video games, but also treat it just like going to the gym. 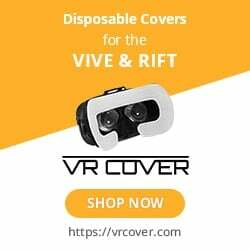 With the Vive in particular, get an insert/visor cover that’s different than the fabric that it ships with and treat it like gym equipment. Wipe it down after every use with some antibacterial wipes… just like going to the gym. Also make sure you keep water close by. Play at your own pace and find what will work for you. Don’t be discouraged if you don’t see results in a week. Just keep at it. My biggest tip aside from drinking more water is that when you step on the scale… don’t freak out and don’t worry about the number. VRFI: Any final thoughts you want to make sure people know before they start? I think that’s just it. I don’t want people to read this story and obsess over a number. I understand that last month, ‘Man Loses 50 Lbs Using VR’ was obviously very attention grabbing, but I don’t want people to take away the wrong lesson. You are more than your weight. You are more than a number on a scale, and your health is more than your fitness. You have to feel good!